Melanoma is a form of skin cancer that occurs when cells in the skin develop abnormally. Melanoma is a form of skin cancer that occurs when cells in the skin develop abnormally. According to Cancer Research UK, around 2,100 people died from malignant melanoma in 2012 and it accounts for more deaths from cancer than all other skin cancers combined. In 2011, 13,300 cases of malignant melanoma were diagnosed, with rates rising more than fivefold since the mid-1970s. In July, the National Institute for Health and Care Excellence published guidelines on assessing and managing melanoma. The guidelines cover the full pathway of care, including diagnosing how far the cancer has progressed, identifying treatments for each stage of the disease, including when it has spread, and outlining the best follow-up care following treatment. The first sign of a melanoma is often a new mole or a change in the appearance of an existing one, says NHS Choices. For men, melanomas are most common on the back, while legs are the most common site for women. Over the past 30 years, rates for malignant melanoma have increased faster than those for any of the ten most common cancers in the UK, says NICE. According to Cancer Research UK, ultraviolet radiation from the sun is the main potentially avoidable risk factor, linked to an estimated 86% of malignant melanoma cases in the UK. Numbers are disproportionately high among younger people, with more than one third occurring in those aged below 55, says the charity. Among those aged between 15 and 34, malignant melanoma is the second most common cancer. It is twice as common in young women as young men, but more men die from it. Other risk factors include pale skin, red or blond hair, a large number of freckles or moles, taking medicines that suppress the immune system, a family history of the disease, and exposure to chemicals such as creosote and arsenic. Asymmetrical – melanomas are irregular. Border – in melanomas this tends to be notched or ragged. Colours – melanomas often have two or more. 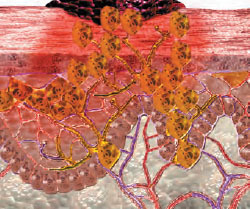 Diameter – melanomas are usually larger than 6mm. Elevation or enlargement – a mole that changes size over time is more likely to be a melanoma. ‘These new guidelines are very welcome. Although melanoma is rapidly increasing among younger people, it potentially affects anyone, so it needs to be on the radar for nurses in every setting. ‘Nurses also play a key role in health promotion, offering advice on prevention and telling people the warning signs to help identify melanoma as early as possible. Having blistering sunburn as a child increases the risks, as does sunbed use, especially in those aged under 35. Godsell G (2012) Reducing the incidence of skin cancers. Primary Health Care. 22, 2, 33-38.